The Lord of the Rings and The Hobbit author J.R.R. 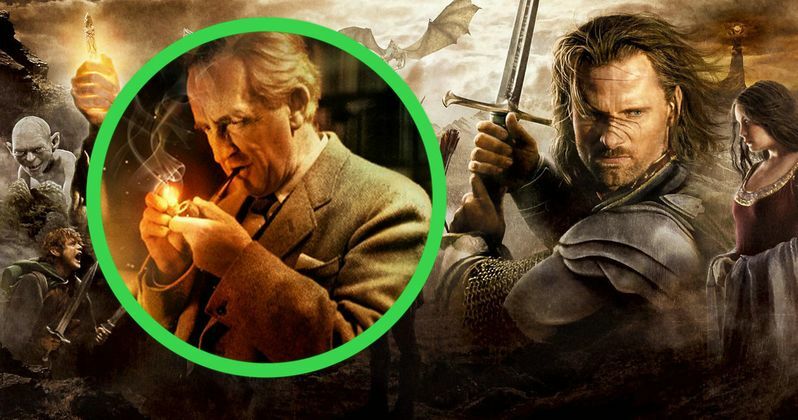 Tolkien will be the subject of a new biopic that is moving forward and has just landed a new director. James Strong, best known for his work on Doctor Who, Downton Abbey and Broadchurch, has signed on to direct Middle Earth, which will be produced by Bob Shaye and Michael Lynne's new company Unique Features. Both Bob Shaye and Michael Lynne gave the green light for The Lord of the Rings trilogy adaptation while they were running New Line Cinema. Deadline reports that the filmmaker will direct from a script by Angus Fletcher, who spent six years researching J.R.R. Tolkien through archival material and personal interviews. Protagonist Pictures is taking care of worldwide sales, with the project expected to be showcased to buyers at the Berlin Film Festival early next year. No production schedule has been revealed at this time. The plot will follow the author's early life and his love affair with Edith Bratt, whom he later married. The couple lived a pleasant life in Oxford before the author was sent off to fight in World War I in 1914. It was his experiences fighting in this war for the next four years that greatly inspired his Middle Earth stories. Bob Shaye and Michael Lynne will also produce with Rachel Horowitz. There was previously a Tolkien biopic set up at Fox Searchlight back in 2013, which David Gleeson (Cowboys & Angels) was set to write the screenplay for. That story was set to focus on the author's days at Pembroke College student and his time as a soldier in World War I. Peter Chernin was set to produce that project, although it never moved forward into production. When Bob Shaye and Michael Lynne green-lit the Lord of the Rings trilogy, it was considered one of the riskiest projects in cinema history, one that paid off quite nicely. The trilogy earned more than $3 billion worldwide at the box office. Bob Shaye and Michael Lynne formed Unique Pictures in 2008, with their credits including When the Bough Breaks and the upcoming Ambition, which Bob Shaye directed. Rachel Horowitz produced hits like About Schmidt and Moneyball while working at New Line. James Strong's made his feature debut with the soccer movie United in 2011, and he most recently directed two episodes of Hulu's 11.22.63.